Baseball Cards plus football cards and other sports cards and selling baseball cards, football cards, basketball cards and hockey cards plus supplies and team items is what we do and have been doing for more than 29 years. 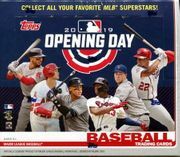 We are the major source and authority for baseball cards and football cards team sets on the internet so be sure to check out our Baseball Cards Team Sets and team sets for other sports too. Click Here To visit our Facebook Page Get news and updates plus more. Over the years we have prided ourselves on our large selection of sports cards with great prices including baseball cards, football cards, basketball cards, and hockey cards for sale. We carry a large assortment of sports cards in the pack, the box, team sets, sets, and by the Single Cards in all your favorite brands like Pacific, Topps, Bowman, Fleer, Ultra, Upper Deck, Skybox, and Finest, plus supplies for all your sports card collecting needs. Collecting Sports Cards is a fun, exciting and educational hobby that can last a lifetime and there are as many different ways to collect as there are collectors. I hope we can help with your way of collecting. If you collect just one team, one player one brand or a little bit of all kinds of cards I'm sure you will find things to add to your collection. 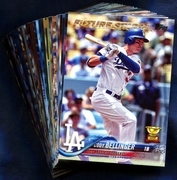 We add new baseball trading card items all the time so you may want to bookmark The Baseball Card Shop site to your favorites list or add a link to our site on your home page and check back often so as not to miss out on cards you may want and be looking for. 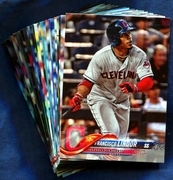 We are your number one shopping site for sports cards. Ordering baseball cards and other sprots cards and supplies from The Baseball Card Shop Online Store is very safe and very easy! When you order from The Baseball Card Shop Online Store, your order is transmitted over a secure channel to our secure server. Our secure server software encrypts information, ensuring that your internet transactions are safe and protected. Your name, address, and credit card number plus every other part of your order, can't be read by anyone else as the information travels from your computer to ours. The safety and security of your order is our number one concern. More people collect baseball cards than any other type of sports cards, however in recent years football cards, basketball cards, and hockey cards have become very popular. Each sports card collection is a personal thing and reflects the individuality of its collector/owner. There are no two collections of baseball sports cards that are exactly the same, At least that we have seen. There is no right or wrong way to collect sportscards all collectors have their own way of collecting. Since sports card collecting is a hobby, what you collect, how much you collect, and how much time and money you spend collecting are entirely up to you. The funds you have available for collecting and your own personal taste should determine how you collect. Information and ideas presented here are intended to help you get the most enjoyment from this hobby and have fun collecting for years to come. It is impossible to collect every card ever produced. Therefore, beginners as well as intermediate and advanced collectors usually specialize in some way shape or form like by collecting only old baseball cards or only new baseball cards or only one sport such as collecting football cards. One of the reasons this hobby is popular is that individual collectors can define and tailor their collecting methods to match their own tastes. 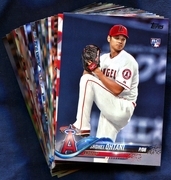 To give you some ideas of the various approaches to collecting baseball cards and other sports cards, we will list some of the more popular areas of specialization. Many collectors select complete sets from particular years. For example, they may concentrate on assembling complete baseball card sets from all the years since their birth or since they became avid sports fans. They may try to collect a card for every baseball player during a specified period of time. Many others wish to acquire only certain players. Usually such players are the superstars of the sport or players that they know or have seen in person, but occasionally collectors will specialize in all the cards of players who attended a particular college or came from a certain town. Some collectors are only interested in the first cards or rookie cards of certain players. Another fun way to collect baseball cards is by team. 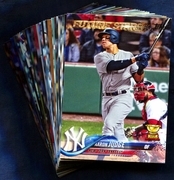 Most fans have a favorite team, and it is natural for that loyalty to be translated into a desire for cards of the players on that favorite team. Collecting baseball cards and other sportscards like football cards, basketball cards, and hockey cards is a great getaway from everyday life and is a fun pastime for the whole family. Trading cards with family members makes for a fun family time together. There are many places that have baseball cards for sale and many places to buy baseball cards, including online stores like this one. 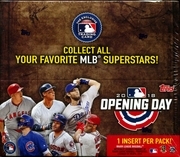 You can buy cards in person at sports card shops, at online stores, at auction sites like Ebay, and to a more limited degree at retail stores (retail stores often only sell packs and sometimes baseball card boxes of the most current cards). Where you buy will often depend on the service you receive and where you feel you can trust the place selling baseball cards. Just like with buying baseball cards, selling baseball cards you have many places to explore. Most times you will get the most for you sports cards when you can sell them directly to another collector. Selling to baseball card dealers will bring less most of the time because they need to resell them for a profit and have they have the various costs to run their business that also have to be covered. Selling baseball cards on Ebay is often the easiest way for many, however many collectors enjoy setting up at shows and flee markets to sell their extras. Others build web sites with their baseball cards for sale. How you choose will depend how much time you want to spend on baseball card collecting, sports card collecting and or if you are continuing to collect or just selling your cards. What ever way you pick it is recommend that you know the value and prices of your baseball cards, sports cards, and other collector cards no matter if they are old baseball cards or new baseball cards. 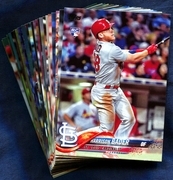 The best way is with a good price guide like Beckett price guides for the current values of cards. Nobody is one hundred percent sure which was the very first baseball card produced, however the hobby of collecting baseball cards dates from the second half of the 19th century, well over one hundred years ago. Goodwin & Co., maker of Old Judge and Gypsy Queen cigarette brands is believed by many to be the first company to produce baseball cards and other sports cards. 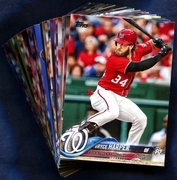 The first baseball cards were small by today�s standards, 1-1/2 inches by 2-1/2 inches, and printed on thick cardboard. The Old Judge picture cards were issued from 1886 to 1890 and more than 2000 different baseball cards from that set have been cataloged, not to mention the many cards made for other sports and non sports. Goodwin & Co. success in marketing baseball cards and other picture cards with their cigarettes lead other tobacco companies to issue sets of their own, and by 1909 to 1911 the American Tobacco Company made the T-206 set with the famous Honus Wagner card. In turn companies in other industries including candy, caramel, and gum makers used baseball cards as premiums to sell their products. The Topps Company dominated the chewing gum/baseball card industry for years until it lost an anti-monopoly lawsuit in 1980, and in 1981 Fleer and Donruss made major sets of baseball cards. Not long after that the baseball cards became more important than the gum and baseball cards became an industry of it�s own. New companies like Score, Upper Deck, Pacific, and others started making cards and the competition led to the high-tech sports cards we have today with the many different brands being made. With so many brands being made came great compition and many of the cards compinies have now fallen by the way side but we still can collect and enjoy the many different cards they made. Major League Baseball trademarks and copyrights are property of Major League Baseball Properties, Inc. The NFL Shield design, and the Super Bowl logo are trademarks of the National Football League. The team names and logos are registered trademarks of the teams indicated. NBA is trademarks of the National Basketball Association. The team names and logos are registered trademarks of the teams indicated. All NHL logos and marks and team logos and marks depicted are the property of the NHL and the respective teams. Trademarks used on this site are used for the sole purpose of selling licensed merchandise and remain the Property of their respective owners.